Born on July 30th 1964 in Göppingen, Jürgen Klinsmann started his career in the second division club Stuttgart Kickers in 1982. When he two years later became topascorer in the division, the big club in the city, Vfb Stuttgart signed him. He would spend his next five seasons there and achived much success, both personally and with the team. 1988 was his first big year. He was topscorer of the Bundesliga and was voted "German Player of the Year". Only set-back was the defeat to Holland on homeground in the European Championship. In the summer of 1989 Klinsmann went abroad. his new club was Inter Milan. He joined fellow countrymen Lothar Matthäus and Andreas Brehme in a great team that mopped up the Serie A title in their first season. 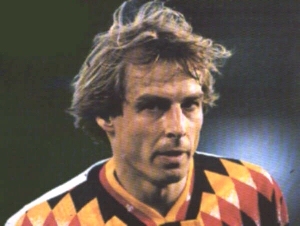 Klinsmann was a continental player, who could easily adapt to new cultures. He played top level football in England, Italy, Germany and France. And France was to be his next destination as he signed for them in 1992. But two years before that, in 1990, he won the World Cup with West Germany in Italy. He played five of the games on his homeground in Milan which made the triumph even more special. Klinsmann was now established as one of the greatest strikers in world football and after two seasons in Monaco without winning any major trophies, it was time to defend Germany's title in the World Cup in America. "Klinsi" was now 30 years old and at the peak of his career. 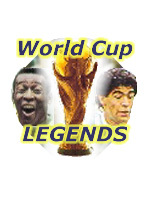 He scored five goals and personally had a great tournament, but the rest of the German heros from 1990 had become too old and failed to reach the standards required of winning a World Cup. Bulgaria won 2-1 in the quarterfinal, and Klinsmann's tears after the game summed it up. His journey through Europe continued and England and Tottenham Hotspur was next stop. He became an instant hit at White Hart Lane, and was voted "English Player of the Year" in 1995. A year later he won the European Championship with Germany at Wembley. He captained the winning side, despite being injured and missed some games. After only one season at Tottenham he joined Bayern Munich, and later Sampdoria, before returning back to Spurs to save them from relegation in 1998. A mission he accomplished. Klinsmann announced he would retire after the World Cup in France 1998. He had been critisized in the press for being "over the hill". But in the World Cup he scored three goals as Germany once again bowed out in the quarterfinals, this time to Croatia. With 108 caps and nearly 50 goals, he is one of the legends in German football.